We’d love to see you and your family out on the farm Friday, October 12 for our Fall Family Farm Day! This is a day off from school, so be sure to take full advantage and head out to Sauvie Island Center for a morning of tasting, exploring, and learning together on the farm. The event runs from 10am-1pm and registration is required, so reserve your spot today! A big thanks to our partner in farm-based education, Whole Foods Market, for making this day possible! http://www.sauvieislandcenter.org/wp-content/uploads/2017/02/SIC-logo-web-340-300x125.png 0 0 Emma Guida http://www.sauvieislandcenter.org/wp-content/uploads/2017/02/SIC-logo-web-340-300x125.png Emma Guida2018-09-25 21:53:332018-09-26 22:57:49Fall Family Farm Day! 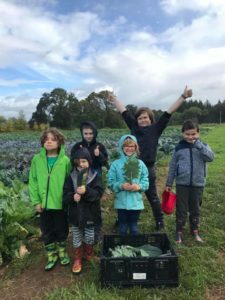 Fall Cookin’ Day wrap up Fall 2018 – a great season!